By admin in Uncategorized on June 22, 2018 . Polymorphism is a well-known phenomenon and represents the ability of a solid material to exist in more than one form. It is not only important from the academic point of view but has also many practical applications or consequences. A typical example is the pharmaceutical industry where many drugs receive regulatory approval for only one polymorphic form. However, there are known examples where the patent was later obtained also for different form. Sometimes the growth rates of polymorphic forms are sufficiently similar that such crystals coexist. In such case we call them concomitant polymorphs. Concomitant polymorphism is rarely mentioned for ruthenium complexes and we have previously never observed it in any of previously synthesized compounds in our lab. However, during her Ph.D. study, Katja Traven has prepared several organometallic ruthenium(II) complexes, among other also with dimethyl 6-(pyridine-2-yl)pyridine-3,4-dicarboxylate ligand. In the latter system two types of crystals were observed in the reaction mixture and studied in cooperation with the Slovak group led by Prof. J. Kozisek. Crystal structures of both polymeric forms have shown that the most bond lengths are approximately the same but differences in the orientaion of methoxycarbonyl groups and p-cymene were found. These concomitant polymorphs also differ in melting point temperatures for cca. 10 °C. 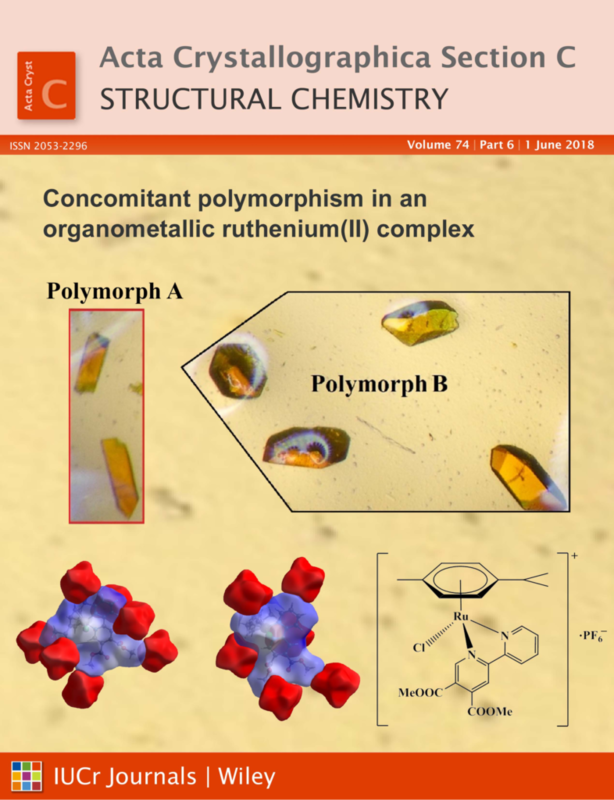 Cover page of paper: K. Traven, I. Turel*, J. Koziskova, L. Bučinský, J. Kozisek*, Concomitant Polymorphism in Organometallic Ruthenium(II) Complex with N,N-donor Ligand, Acta Crystallogr. C74, 683-689 (2018).